KISHA & JEN!!! 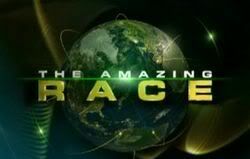 The second straight all-female team to win The Amazing Race!!! And like Zabrina & Joe Jer in Amazing Race Asia, Kisha & Jen do not win a single leg until the finish. They just pulled off an Eric & Danielle! Well, I didn't see a memory task, and I didn't see a photo finish. I've got to stop trusting those interviews and CBS hype. OMG. I can't believe it!! It was my fave team (after K/V) but was so UTR the entire season, that I was kinda meh with them. They did an awesome leg, and that's why they deserved it. Yes! Yes! Yes! Congrats to Jen and Kisha! CBS had us all fooled this season lol. I'm rooting for both teams and i'm glad it went either way! Gallory won the first leg and Kisha and Jen won the last. I can die a HAPPY MAN! Congratulations to Jen and Kisha and congrats to the final 4 teams. Good job! Ditto Joab! They were my second favorite and deserved the win! CONGRATS TO KISHA AND JEN!! I teared when Kisha and Jen said their winning speech. All they could think of was their mom. Truly deserved it as the MOST consistent team on the race this season. They didn't do an Eric and Danielle. Eric and Danielle were backpackers and Kisha and Jen were not! We must come up with a term for a deserving team who was front of the pack the entire season but never winning a leg!!! OMG! ANOTHER ALL-FEMALE TEAM WINS! Yeah, they weren't my favorite team -- Zev & Justin and Gary & Mallory are ahead of them, but they were in my top 3 teams. And they never were in danger of being eliminated. They were the best team, and I'm glad LaKisha & Jen won. 2 season of great TAR in a row after the disastrous TAR 16 for me. Now even if the next one's not good i'll just keep watching these 2 seasons! I have to congratulate the editors this time for not forgetting about Gary & Mallory once they got so far behind. Definitely not an Eric and Danielle they had more top five finishes than any other team this year. Good job by WRP and CBS for fooling the "winner's edit" theory. Wow!Would not have called that!Congrats Kisha and Jen!! NOW, WHO WANTS TO HUNT DOWN THAT CAB DRIVER WHO DESTROYED GALLORY'S CHANCE AND DESTROYED A THREE-WAY FINALE FOR US??? I just realized: both TAR all star series had winners that did not win any previous legs.